For many households, gathering around the table for family meals is as obsolete as a rotary phone. Regular sit-down dinners have been lost to demanding schedules and never-ending after-school activities. In fact, according to a recent survey, 10 percent of American families don’t have a single meal together each week. It’s no surprise that time is the number one barrier to preparing healthier meals at home–and skipping family meals may seem like an easy solution, but when it comes to the overall health and happiness of your household, dining together should be a high priority. 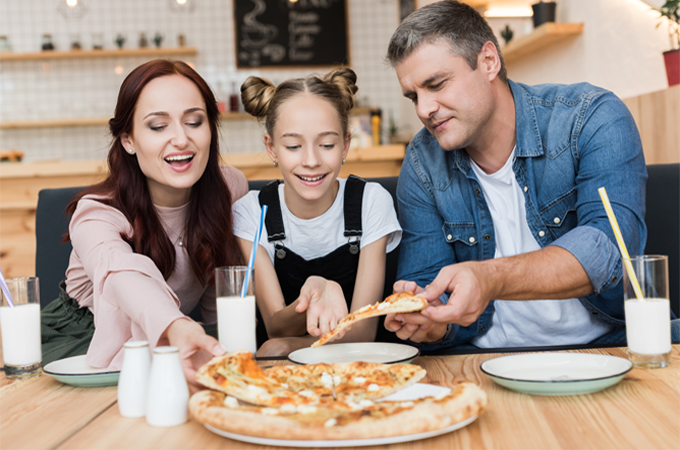 Here’s why: recent studies link regular family meals (3 to 5 meals per week) with lower rates of risky behaviors, teen pregnancy and depression, as well as higher academic performance and higher self-esteem in children and young adults. Plan: According to data from the Hartman Group, more than half of dinners in America (53%) are planned within an hour of eating. Plan your weekly menu using the USDA’s MyPlate as a guide to learn what foods groups make a meal healthy– and don’t forget the dairy! Experts agree milk with meals is an easy way to ensure your family is getting the nutrition they need. Milk provides three of the four critical nutrients that Americans may not have in their meals– calcium, potassium and vitamin D.
Prep: Take advantage of any extra time on weekends to prep foods for future dinners in advance. Our Overnight Ancient Grain Hot Cereal is perfect for busy mornings and can be prepared the night before. Pairing grains with milk provide your family nine nutrients including calcium, vitamin D and protein to power through the busy mornings. Pack Pantry & Fridge Essentials: Save time and money by using what you already have on hand either in your pantry or fridge. Stock your pantry and fridge with your family’s favorite meal ingredients which can be tossed together for an easy one-pot meal like shredded cheese, whole wheat pasta and frozen vegetables. Cheese is a great addition to any pantry meal and can be incorporated into most diets. For vegetarians, cheese is an important source of high-quality protein and those with lactose intolerance can enjoy natural cheeses that are low in lactose, such as Cheddar and Swiss. Registered dietician with The Dairy Alliance educating health professionals and the general public about the importance of dairy in the diet.